Richard Crooks was born in Trenton, New Jersey in 1900. He showed great promise as a singer in his youth and after a series of standard jobs found his way to Europe and study. He sang opera in Germany, with the Berlin State Opera, as well as with the Brussels Opera and in Sweden. He took part in the notable premier of Mahler's Das lied von der Erde in America. The role of Cavaradossi in Puccini's Tosca became associated with him in Hamburg in 1927 and then in Philadelphia in 1930. In 1933 Mr. Crooks made his Metropolitan Opera debut as Des Grieux in Massenet's Manon, his most-famous role. He had 37 curtain calls that evening and he remained a great star of the Met Opera until the 1943 when health issues forced him to cut back on his activities. 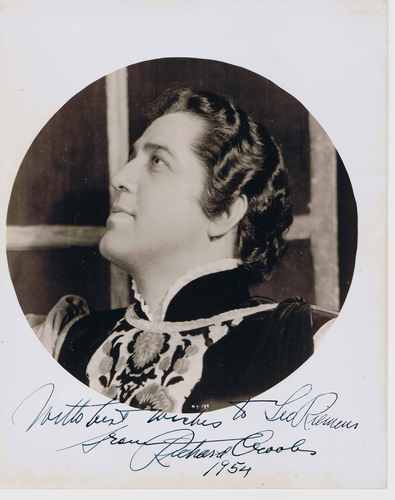 Other roles in which he excelled were Gounod's romantic heroes Faust and Romeo; Wilhelm Meister in Ambroise Thomas' Mignon; Don Ottavio in Mozart's Don Giovanni; Prince Avito in Montemezzi's L'Amore dei tre Re, and Lt. Pinkerton in Puccini's Madama Butterfly. 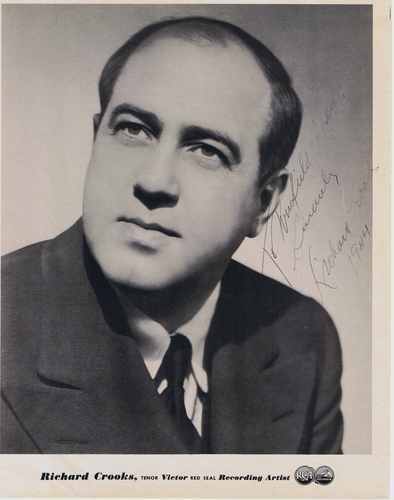 Although his operatic repertoire in the USA was limited to these roles, in Europe he had sung both of the "lighter" Wagner roles, Walther von Stolzing and Lohengrin. On the radio and in recital and concert Mr. Crooks became a great favorite with the American public. He became the voice for the popular radio program The Voice of Firestone, and thankfully, many compact disc transcripts are available. "Ah, Moon of My Delight" from Liza Lehmann's In A Persian Garden was one specialty for him on radio and in concert. Mr. Crooks was also a great star on Victor, later RCA Victor, records from the early 1920s until after WW II. He recorded arias from opera and oratorio, operetta melodies, Stephen Foster, Franz Schubert, parlor ballads, folksongs and sacred literature. In 1929 he and Lawrence Tibbett were featured with the Trinity Choir in a now-classic recording of John Stainer's The Crucifixion. There are currently a number of CDs available of these RCA Victor 78 shellac records. He retired for good in 1950 and settled into a country gentleman's life, being active in the arts in one way or another until his death in 1972. Richard Crooks was one of America's greatest singers. The contents and visual images on this page are the property of Keelan Music Archives/www.keelanmusic.com. Please write for permission to use them on other websites. copyright 2008. 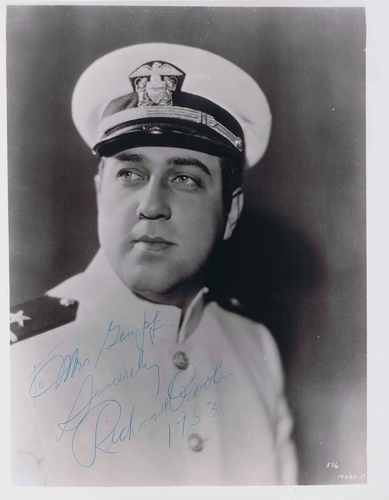 Richard Crooks occasionally sang the role of Lt. Pinkerton in Puccini/Illica's "Madama Butterfly"